Remember that one? It’s got a bad rep, as the tastless tree like cousin of broccoli. It’s not though. In season now, it’s cheap, tasty and adaptable to oodles of dishes… just right for Frugal Friday. Cook it up until soft. Then blitz it up with a hand held blender. Serve with a scattering of lightly fried sourdough breadcrumbs, for some textural crunch. * Remember all potatoes are not created equal. A good potato can be the making of your dish. This entry was posted in Food Glorious Food, Making, Creating + Frugal Living and tagged budget, cauliflower, frugal, local, Making, Creating + Frugal Living, recipes, seasonal, simple, soup, vegetable, winter by cityhippyfarmgirl. Bookmark the permalink. We actually had that for tea on Wednesday night with some sourdough bread! A little sprinkle of cayenne as you dish up is nice. I also like a little chopped up fresh chilli cooked up with the bread crumbs. I love cauliflower too. And I love that this has zucchini – I try to put zucchini in everything this time of year. I made one the other night and browned the cauliflower for extra flavour before adding stock etc. The other flavour I added was finely grated parmesan. Yummo! Thanks for reminding me, I love cauliflower and this is just the recipe for the colder weather we are having in Brisbane at the moment. 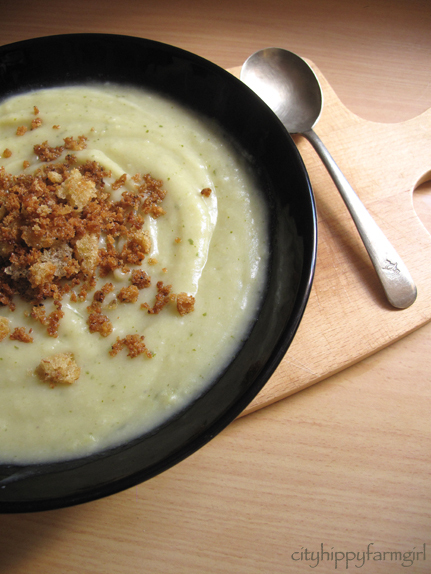 i love cauliflower and your soup look like a perfect winter dish..yum! YUMMO….looks really delicious & super simple (exactly my kind of recipe). In soup, or curry,or with a cheesy sauce- my favorite is raw with a sprinkle of salt! Heidi I can’t find your blog?? Thanks for the yummy recipe. I like the idea of some toasted bread crumbs on top. I love cauliflower and have some in the fridge right now:) Thanks for sharing a great soup recipe! I don’t actively dislike cauliflower but I do think of it as the poor cousin of brocolli. That said, I much prefer the look of this to the idea of brocolli soup. Something to try I think, especially while the weather is cool. I love cauliflower soup! And cauliflower risotto! Good reminder to get to it. Yum. I actually prefer cauli to brocc. And it’s been on the menu at least four times this week. Guess that means I’m being seasonal. Love the little spoon beside the bowl. Dear Mariana I think you doing seasonal cooking would just be innate. I am so making this on our pot belly stove this weekend. Thanks! It appears that there are a lot of cauliflower lovers like myself after reading the comments. The soup sounds terrific! I think you have a good idea. LOL. I too love cauliflower! i love it baked, in curry, in stir fry, under much cheese sauce…yum. We have one just starting to flower in the veggie patch. it will be the most watched over cauliflower ever and if it grows to a decent size, will be the centrepiece of some great dinner. Looks yum, we often have cauliflower and bacon quiche, its a firm favourite. It’s such a good ingredient! I’ve never done anything with on my blog I don’t think… I’m a little ashamed… thanks :). It’s good when curried. I love this veggie in soup, it’s also just so nice as a thick creamy puree to go with meats. Yummo!